Relevant Radio airs novena from national shrine in Wisconsin across U.S.
CHAMPION, Wis. (CNS) — As the autumn days become shorter and colder, the National Shrine of Our Lady of Good Help in the Diocese of Green Bay continues to see a steady number of pilgrims. 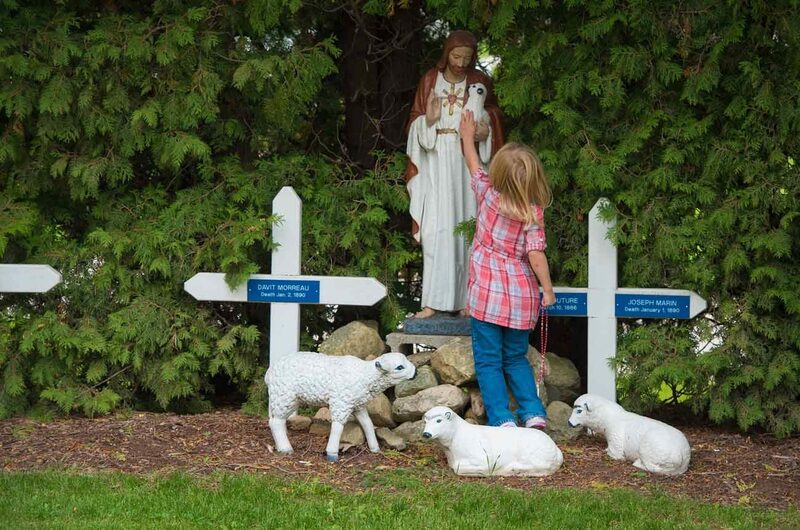 On the Aug. 15 feast of the Assumption of the Blessed Virgin Mary, Green Bay Bishop David L. Ricken announced that the site in Champion had been formally designated as a national shrine by the U.S. bishops. Since then, the number of visitors, possibly piqued by curiosity of the shrine’s national designation, has continued to grow, according to Walt Fountain, operations manager at the shrine. In October, the trend has continued and multiple events have been planned at the shrine, beginning with the inaugural National Novena to Our Lady of Good Help. The novena, which began Oct. 1, will conclude with the celebration of an Apparition Day Mass by Bishop Ricken Oct. 9. Relevant Radio, a network that includes 64 radio stations reaching 30 states, was airing a recorded version of the national novena prayer by Bishop Ricken several times each day during the novena. It also planned to broadcast the Oct. 9 Mass live. Among the hundreds visiting the shrine that day were Carolyn and Santi Ocari and their two young children from Rochester, Minnesota. Carolyn was confirmed at Holy Cross Parish in Bay Settlement, he added, “so she had been here before.” Both graduated in 2010 and were back in Green Bay for a wedding. After learning about the shrine and its national designation, he decided that “we are absolutely going” to visit. That national designation came nearly six years after Bishop Ricken formally approved the apparitions of Our Lady of Good Help to Adele Brise, which took place on three occasions in October 1859. His decree on Dec. 8, 2010, made the shrine at Champion the only site in the United States with a church-approved Marian apparition. “We’ve gotten lots of good help in people telling others about what our Blessed Mother came here to tell people and (she) wants people to come back and be embraced by her as she brings them closer to her son,” said Fountain. According to Fountain, word of mouth, as well as national coverage from the Eternal Word Television Network and Relevant Radio has helped bring more pilgrims to the shrine. Other events planned for October include welcoming relics on two separate occasions. “Relics of the Passion,” including a relic of the True Cross, will be at the shrine Oct. 14 and 15. “Treasures of the Church,” with approximately 150 relics of the saints, will visit the shrine Oct. 17. At least two large pilgrimages are planned in 2017, Fountain said, including an August pilgrimage for the Order of Malta, which will draw upward of 250 people. Editor’s Note: The schedule of broadcasts airing on Relevant Radio related to the national shrine in Wisconsin can be found at www.relevantradio.com. The website for the shrine is www.shrineofourladyofgoodhelp.com.